Margaret Builder as born in 1938 in Sydney and was educated at Methodist ladies College Burwood. Now a registered osteopath, physiotherapist and acupuncturist living in Nambucca Heads NSW. Over the past three years, Margaret has emerged as an abstract painter of substance, having completed several bodies of paintings. Her art education was mainly as a private student with Stanislau Rapotec for 6 years, between the ages 23 to 29. Recently Margaret has worked under the tutelage and guidance of Australian abstract artist, Peter Griffen. "I watched them grow as artists by just doing one painting after another with no judgement. What a lesson for a goal oriented white feller". 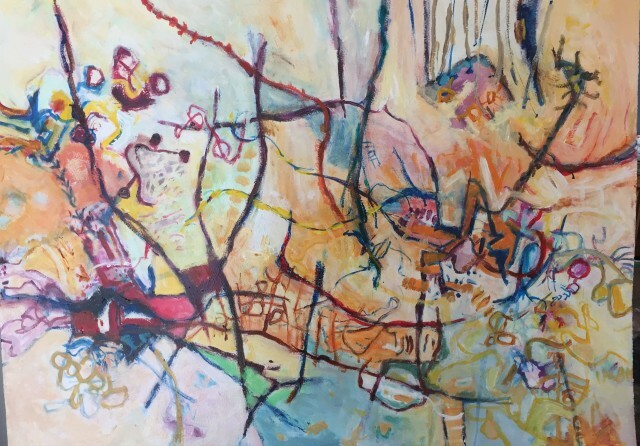 Margaret's paintings exhibited in Into Abstraction explore line, colour and form in her vibrant, lyrical style. With references to John Olsen and Wassily Kandinsky, alongside the Indigenous painters of the Western Desert, these abstract studies express great joy in their colourful fields of spidery lines and shapes.